Groundbreaking Japanese illustrator and artist Shojono Tomo is interviewed by TokyoMade co-founder Deanne Tonking who wants to know where she finds her inspiration. thank you very much TOKYOMADE! Japanese artist Shojono Tomo (friend of little girls) worked as a graphic and goods designer before becoming an independent free-lance illustrator in 1990. She has produced illustrations, comics, music, fashion and more, and is increasingly becoming well-known at a global scale. Shojono Tomo takes inspiration from the colorful life that she leads to create eye catching and eclectic illustrations which she then blends with fashion pieces and accessories. Deanne: When we first spotted your fashion and accessories in the Shinjuku Marui One store we instantly thought of them as the epitome of Japanese street style, how would you describe the essence of the fashion you design? Shojono Tomo: First of all, I am not a designer. Originally the idea was to use my graphics and put them onto clothes, that is how I started making my clothing lines. When most people think about fashion they usually think that it should be something that makes people look beautiful. I think fashion is goods that appeal to the real person within and individual characteristics. For me fashion is more like a tool of communication, a way for me to send messages to others. What is interesting to me is people who say they are not into art, don’t go to museums or galleries and yet when it comes to fashion, those people easily transform themselves into a canvas. 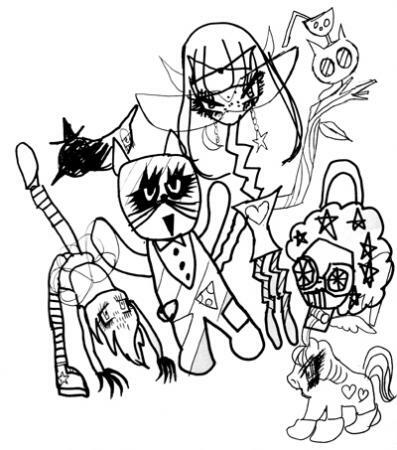 You define my fashion as Japanese street style but I would have to say I am heavily inspired by outsider art, psychedelic images, rock, graphics, manga, fancy and Yankeeism. These, for me, are all about the scream of the mind. From these inspirations I concoct something like a sumo wrestler’s stew, that is very hot and awkward. This is probably the best way to describe who I am and what I do. 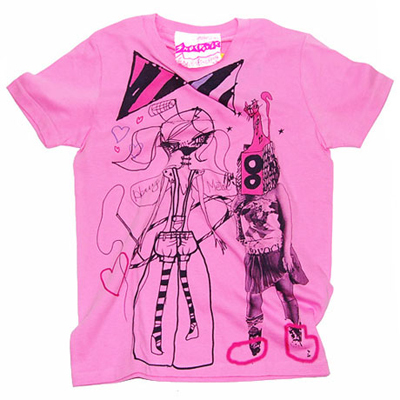 Deanne: Many of the characters that feature on your t-shirts and other pieces appear to be a quirky combination of human, animal and object. Where does the inspiration come from? Shojono Tomo: I am so inspired by the diversity of my surroundings. Objects that transform, like a broken down bridge in the mountains that begins to resemble a waffle waiting for it’s toppings. I find inspiration in the mess that is left after a typhoon, by people who come to a party but read a book in the corner. Ideas come from people who do not stick to the rules and who introduce me to a new world that I previously had not belonged to. I see somehow these things as imperfection but they possess strong will and a certain melancholy and originality. 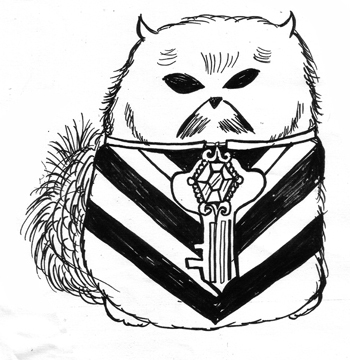 Deanne: Your use of funky felines in your illustrations make me think you might be a cat person. Are you a cat or a dog person? Do you have pets? Shojono Tomo: My dad always said the death of animals brings great pain and my mother is not an animal lover, so growing up I was influenced by their feelings and have never had pets. I like cats that are old and fat with bad breath rather than good looking ones. I would like to keep one if I knew it would live longer than me. To be honest, I didn’t realize that I used felines in many of my illustrations but I would have to say that I am a cat person. I like the way cats are selfish and like to take naps on people’s laps. I also like when they are friendly and do not refuse when I ask for a hug. Deanne: I am a big fan of your fashion line and love wearing your eye catching t-shirts, they get so many compliments. How do you feel when you see other people wearing your designs? Shojono Tomo: Thank you very much. I am so happy to hear that you love to wear my clothing, not just love looking at my fashion. This means you feel good in my clothing, right? I am always very happy to witness the moment when people transform their feelings by wearing the clothes I make. I get many compliments from people about my fashion, most people see my work as a halfway point between cute and cool. Recently though I got a comment from a person about my illustrations, they asked what I was so angry about. I was also asked a similar question by a German TV interviewer. I am not sure about this but perhaps they have a point, they interpreted my work and maybe uncovered something I was not aware of. I have to say I am not entirely comfortable with common catch-phrases in Japan such as “Girls should be cute”. I would say that if my clothes are considered cute then they are a salty kind of sweetness not like sugary sweet. I think people who understand this understand my art and fashion and are the ones who choose to wear it. That makes me happy! Deanne: Do you get much feedback from your fans? Do you design with your fans in mind or do you grab inspiration from other places? Shojono Tomo: Of course I always think of people who love shopping, I think about how they would wear my clothes and who fits into my fashion. However my main focus is on the graphics and illustrations, sometimes they do not translate to fashion. There is often a dilemma in that I would like to keep the graphics in their original form but need to work with ways of putting them on fashion and accessories. I would also love to make an original body for my fashion but I know once I do this there will be a catch-22 situation. Where would my focus go? So I have decided to compromise, my focus is on the graphics and illustration not the design of the canvas. Deanne: As you know I am a hula hoop dancer so when I saw your Hula Hoop Rock Star t-shirt I was so excited! Did you play with hula hoops as a child? Where did the inspiration for that t-shirt come from? Shojono Tomo: Thanks! I saw you hooping and it was awesome! I could not hula hoop as a child, kind of sad. In fact, I have to tell you that it was only a few years ago that I learned to blow bubbles with gum and snap my fingers, I think my development in those areas was a little delayed. I like to watch people spinning hula hoops on their waist, it gives new dimension to their mid section, I think that is cool. It makes me think of the character DeLorean, the car from Back to the Future, the way that it goes in and out. I drew the hooping character very naturally, the hoop is a symbol of the Heavy Metal Circus. The hoop is her tool and adds beauty to the image. 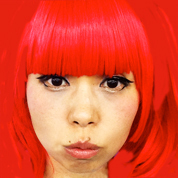 Deanne: Japan, and Tokyo in particular, is a mind blowing mix of subcultures. What groups within this very fashionable city are your fashions most suited to? Shojono Tomo: If I really had to categorize my creations I would say they are pop art fashion. I hope that my fashion is most suited to individuals who choose the pieces based on their own characteristics. Deanne: We are so happy to have your fashion line available on Tokyo Made, where else do you sell your pieces? Shojono Tomo: I like to put my creations in independent and unique spaces. My one-of-a-kind pieces and custom painted products can be found at Spank! in both Koenji and Shibuya. Spank! 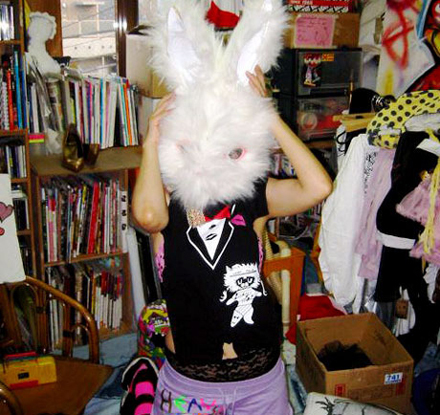 is one of the most interesting second hand shops in Tokyo and has a huge fan following. I select stockists that are interesting and original. 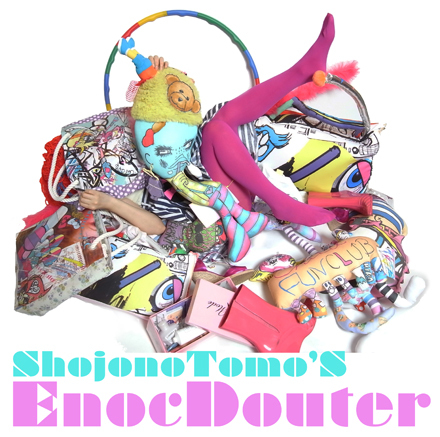 My fashion and accessories can be found at ShojonoTomo, TokyoMade, FEW MANY (Shinjuku), mememachinegallery (Shibuya), SPANK! (Koenji・Shibuya), SCREWMING (Taiwan), AIME CUBE (France), L’art de rien (France), Boddywood (France), Anna Lou (London) and Yo-you (Hachioji, Sangenjaya and Kawaguchi). Deanne: What does the future hold for you and your fashion labels? Shojono Tomo: This Fall in London you will see my accessories at Top Shop. I am also creating some ties in collaboration with Anna Lou in London. Deanne: Tomo San thank you so much, your personal style, design brilliance and business savvy is a true inspiration! 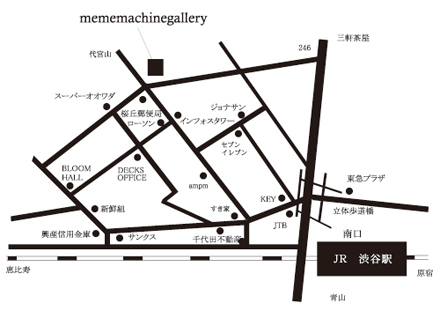 Your chance to get up close and personal with Japan-based independent fashion for one week at the mememachine Gallery in Shibuya.